We’re specialists in fitting vinyl flooring suitable for bathrooms, kitchens, hallways and many more rooms within the home. We can remove old vinyl flooring free of charge to make room for your brand new vinyl flooring. We aim to make sure that purchasing your new floor vinyl is as straightforward as possible. 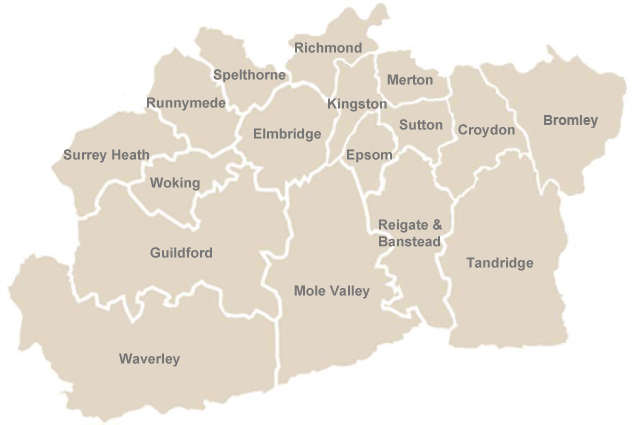 It’s this dedication to our customers that means we have an unrivalled reputation as one of Surrey’s leading suppliers of vinyl flooring. We pride ourselves on our traditional face-to-face service where we’re able to bring a range of vinyl samples to your home or business premises to browse, feel and choose from – making it as easy and convenient for you as possible. Our range of vinyl is hard wearing so you can be assured that your flooring will last you for many years to come. Unlike brittle floor tiles made of minerals, vinyl flooring is made of material that has some elasticity which gives the flooring a degree of flexibility called resilience. 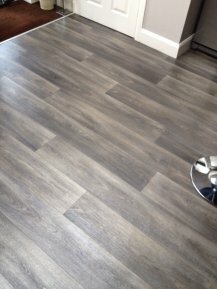 Vinyl flooring is available in large rolls or pre-cut tiles, and either comes with pre-applied adhesive for peel-and-stick installation or requires adhesive. Made from a number of layers, the vinyl flooring used ensures a strong bond is created which joins the vinyl to the subfloor. 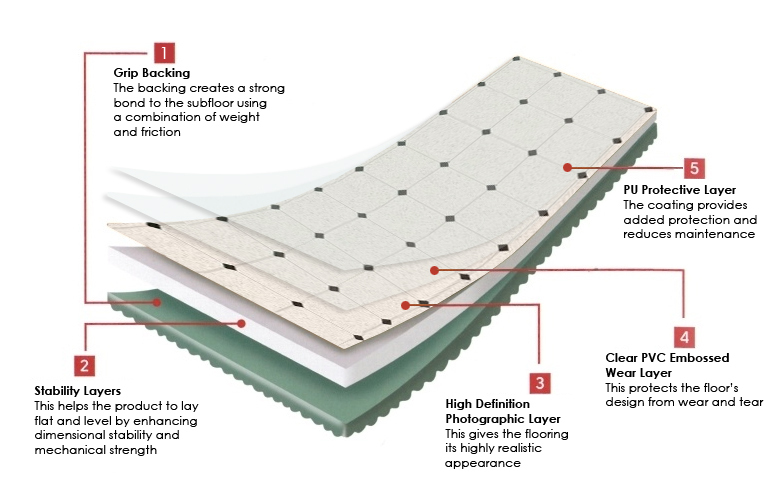 A stability layer helps to ensure the flooring is laid flat and enhances the stability and strength of the floor. A high definition photographic layer gives the flooring a realistic and natural appearance. A Clear PVC embossed layer helps protect the floor's design from day-to-day wear and tear. The PU Protective Layer coating provides added protection and helps reduce maintenance. All our products vary depending on the method of production used by the manufacturer and may differ from the specifications show in in this diagram so please check with one of our flooring specialists prior to ordering your vinyl flooring. Choosing a new vinyl floor for your bathroom, kitchen or hallway is a big decision which you'll want to make sure the right choice is made during the initial planning stages. We’re able to guide you through the various options available to help you make the right decision. If you've already chosen the type of vinyl flooring you'd like then we offer a free estimating service to give you a good idea on how much it’ll cost to supply and install your new floor. 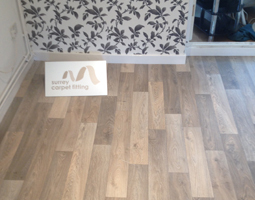 If you have already purchased your vinyl flooring and just need it fitted then we also offer a fitting-only service. Our estimating service is free. Once you've selected your vinyl, underlay, any accessories and additional services you'll need such as removal of your old vinyl, we'll arrange a suitable time for one of our representatives to visit your home to measure up. If you’re able to supply us with the room measurements then we can give you a guide price based on your own measurements, however the exact price estimate for your flooring and any fitting charges will be based on a site survey and the measurements taken by our onsite estimator. Our estimators are able visit your home at a convenient time to measure your rooms, and provide advice on underlay and any preparatory work required to ensure your new vinyl flooring looks their best. 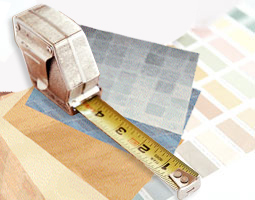 Our estimator will measure the areas and provide you a few price options for the most cost-effective way of fitting the vinyl flooring and any other options available. Please note that while our estimate aims to be accurate, we can't foresee every issue until fitting has begun and the existing flooring has been removed. Additional charges may be necessary, but we will of course discuss these with you before proceeding. 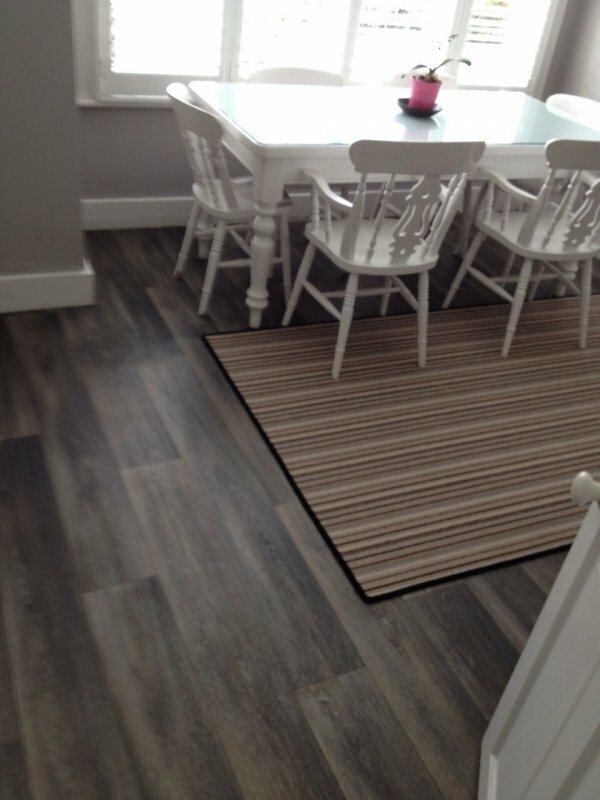 Once your vinyl flooring has been delivered to us from our manufacturers, we'll arrange for one of our team of experienced fitters to come and lay your new flooring. We’re able to give you an estimated date when you place your order with us however each type of vinyl varies depending on the manufacturer’s availability. It is advised to make some preparations before your vinyl floor fitter arrives to fit your flooring. Please move any furniture and remove any old flooring to leave the room clear and ready for the fitting. If you require assistance in moving large furniture then please discuss this with the estimator so we can ensure the right precautions are taken on the day of the installation. You will need to be present on the day of the installation so that our floor fitter can discuss your requirements and raise any unforeseen issues. Our fitters will prepare your sub-floor as necessary and lay your new floor so that it's just right. When they've finished, they'll remove any waste including your old flooring if you've booked the disposal service. They'll then leave the room looking tidy, so you can start enjoying your beautiful new floor. Here's some of the more popular wooden-effect vinyl floor finishes available, however if there's a particular type of carpet you require then please speak to a member of staff. The below wood samples are used as a guide only and may vary compared to the physical vinyl samples shown to you by one of our representatives. Please see below for a range of photos which should help illustrate how some of the various wooden-effect vinyl flooring options look when in situ. If you require more photos or close-up photos to help you make your decision then please feel free to contact us where a member of our team will be happy to help you with your enquiry.